Michael James Price was born in Kidderminster, England, and moved to the United States with his parents that same year. He received his undergraduate and law degrees from the University of Minnesota. He served as a claims examiner for the United States Veterans Administration before becoming an assistant Winona County Attorney. 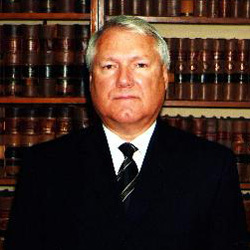 In 1974 he joined the law firm of McMahon, Darby, Price and Brooks. Since that time he has devoted his distinguished career as a lawyer to representing the people of southeastern Minnesota in criminal, personal injury and general legal matters. Together with Twin Cities attorney Doug Thompson, he tried one of Minnesota's most famous homicide cases, State vs. Howard. Beginning in 1976, he taught courses in both civil and criminal law as an adjunct professor at Winona State University for over a decade. He has served as a board member, officer and advisor for a wide range of community organizations, including the Gamehaven Council of Boy Scouts of America, Winona Area Volunteer Services, United Way of Greater Winona, Watkins United Methodist Home and Winona County Chapter/American Cancer Society. We Work One-on-One with Our Clients. Contact us today! Michael J. 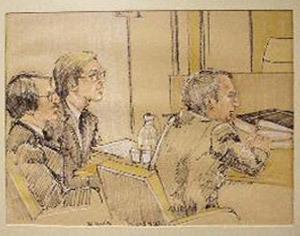 Price, left, with Donald Howard and co-counsel Doug Thompson in the 1978 homicide trial of State vs. Howard.